NVIDIA just announced their newest GPU the NVIDIA GeForce 310. 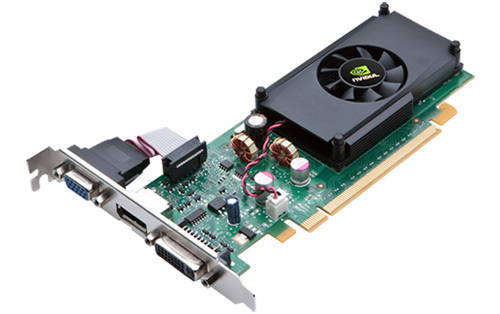 It is an entry level graphics processor that will be used to replace the users standard integrated graphics card. The GeForce 310 offers 16 CUDA cores with a 589MHz processor. It comes with 512MB DDR2 Memory clocked at 500MHz, offering a 64-bit memory interface with transfer speeds up to 8GB/sec. The card also offers the usual shebang featuring a DisplayPort, DVI and a VGA port, two of which can be converted with a simple adapter to HDMI outputs. The card supports 10.1 DirectX and 3.1 OpenGL. And supports resolutions of up to 2560×1600 on DVI, and 2048×1536 on VGA. While the card is able to push out enough power for hardware accelerated 1080p high def video, it’s probably not going to be enough for discerning PC gamers looking for a powerful solution for their gaming needs. No word yet on pricing or availability for the new chipset. Just went through Nvidia G210‘s specsheet, and it seems like Nvidia has pulled a quick one on the customers here, they’ve only rebranded the 210 card as GeForce 310. It’s a sad sad state of affairs at Nvidia, tricking customers into thinking that they’ve launched a brand new card.